A cool new feature for Advanced Set creation is queued-up and waiting for Apple to approve. Once Apple approves, the feature will appear in the next update of US Coin for OS/X. This is the version for folks using iMac desktop's, or MacBook and MacBook Pro computers. Honestly, US Coin for OS/X is the best version we have. Coin category, or sub-group. For example, the picture above shows "Half-Cents & Cents" as the Category. The category includes 1/2 Cent coins and Cent coins, of which there are many. Some categories (Dollars, Nickels) cover only a single denomination, while others (Gold Coins) may contain several different denominations. This is just the way Numismatic 'experts' have grouped coins for the last 10,000 years (give or take). These fields allow you to provide a short name and longer description for the Set. I typically just copy the Category to the Name and the Types description, to the Description. If you do the same, let me know and I will have the software simply do that as a default behavior. Near the top, left of the list you will notice a check-box labeled 'Select/Unselect' checking this check-box will cause every row in the Issue list to also change to either Selected (checked) or Unselected (unchecked). This makes it easy to quickly mass-select, mass-unselect all issues. Near the top right you will notice the number of Issues found for the Type. This column shows 'Yes' when a matching coin is found in your collection. A match is determined when the set coin's PCGS reference number matches a coin in your collection. If you have a coin in your collection with the same PCGS ref. number, then you have a match for this particular issue in the Set. This column shows a check-box. When you click Save, the program will create a new set and will add every issue that has the check-box 'checked'. Un-check any coins that you would like to exclude, not add, to the set when it's finally created. This column simply shows the official numismatic description of the coin issue. This option determines a very powerful improvement provided with Advanced Sets, automatically matching set issues with coins already in your Collection. This feature is so cool I should be paid money for the update. When you create a new Set, some of the coins required for the Set might already be hidden within your current Collection. This option does a powerful search of your Collection to find and then attach any coins you might already have. This option was provided to allow you to control what previously was built-in behavior. 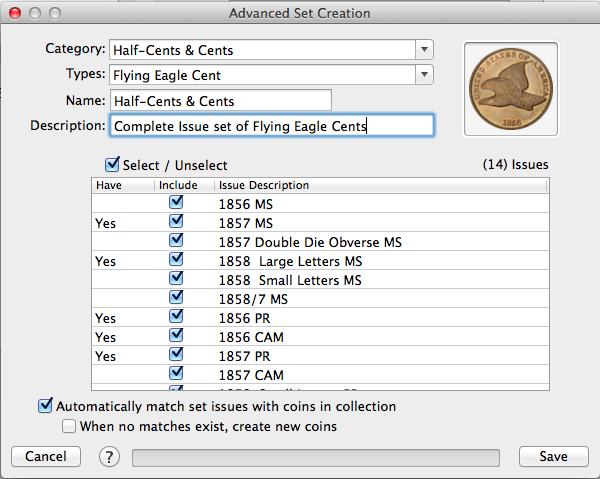 When a new Set is created, the software can automatically ALSO create coins representing the new Set issues, in your Collection. Lots of people found this feature useful. Others hated it. Check the check-box if you would like new Coins to be created in your Collection WHEN you don't already have them. These new coins will automatically appear in your buy list report (cool feature).